In EU-funded INSPIRE4LIFE project, SRC Bertin Technologies and Rescoll have developed an automated system to detect plastics containing brominated flame retardants (BFRs) in electrical and electronic waste (WEEE). EU regulation requires that WEEE containing BFRs be separated out of the recycling stream, because of concerns about these chemicals. The Quantom InLine technology uses LIBS (Laser-Induced Breakdown Spectroscopy) to both identify the polymer, enabling sorting of the WEEE plastics, and to detect the presence of BFRs, enabling exclusion of contaminated materials from the recycling streams. 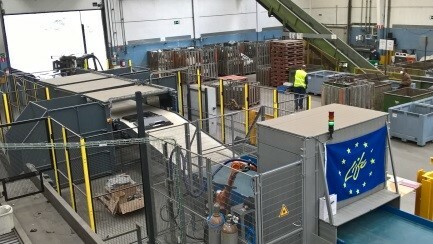 The system is fully automated, operates even on coloured or black plastics, achieving 97% accuracy in polymer determination, and can treat 12 items/minute (up to 150×80 cm), that is around 1.3 t/h. The following polymers are identified: ABS, ABS-PC, HIPS, HIPS-PPE, ABS-PMMA, PVC, PA, PP-PE, PPT. Flame retardants (Br, Cl, P) are identified from 1% w/w (of element, e.g. 1% P). Demonstration trials have successfully produced 3D printing filaments from 100% recycled HIPS (sorted, shredded and mechanically re-extruded).